After the invasion of Nadir Shah and acting on his advice Nawab Zakaria Khan decided to totally exterminate the Sikh community once for all. To achieve this objective, he issued instructions to his officials and to village heads to kill or arrest alive Sikhs, wherever and whenever found. He also announced cash rewards of Rupees ten, fifty and eighty respectively for informers, killers and arresters of the Sikhs. As a result of these orders of Zakaria Khan, the Governor of Lahore (now in Pakistan) thousands of Sikhs, men, women and children were killed and arrested without any rhyme or reason. The notorious village heads and officials who carried out the orders of the Governor to gain his favours were Karma of village Chheena, Rama Randhawa of village Talwandi, Sahib Rai Sandhu of village Naushehra Dhaala, Har Bhagat Niranjania of village Jandiala, Dharam Das Topi of Jodhnagar and village heads of villages Naushehdra Punuan and Majitha. They sent cart loads of heads of Sikhs to Lahore, in addition to thousands arrested and sent to Lahore for execution in a merciless manner publicly in Lahore daily. They even killed women and presented their heads for reward. Massa Ranghar, the village head of Mandially exceeded all limits and behaved in a most hated, mischievous and offensive manner, hurting religious sentiments of Sikhs, after he was handed over charge of Sri Darbar Sahib (Golden Temple), in Amritsar. The premises was captured earlier by the Governement forces. He used parikarma of the premises as stable for horses and main Hall of holy Golden Temple as a Dancing Room. He would seat himself on a beautiful cot (Palang), smoke hukka and watch prostitutes dancing in the main hall of the most sacred place of the Sikh community. Around the building he had posted armed guards to prevent entry of anyone and everyone without permission. Due to persecution in Punjab the Sikhs had moved to hills, Jungles, ravines and deserts. One such group (Jatha) of Sikhs was temporarily camping near Jaipur City in Rajasthan. Some-one communicated to them the sad news of desecration of Harimandir Sahib at Amritsr. The heart rendering account of misdeeds of Mass a hanghar sent shock waves through the hearts of all the sikhs present there. One among them, Bhai Mehtab Singh immediately jumped to his feet and volunteered himself to punish and culprit Massa Rangar forthwith. He announced that he would serve the head of the wretched Massa in Amritsar and bring it back in Jaipur to show the same to all Sikhs present here. Another Sikh named Bhai Sukha Singh volunteered to accompany Mehtab Singh, to help him accomplish the sacred task. Both were granted permission by the Jatha chief and special prayer was held for the success of their mission. Both Bhai Sukha Singh and Bhai Mehtab Singh immediately proceeded towards Amritsar and arrived there in the month of August, 1740. They put on the garbs of village chaudharies and carried with them a bag full of well ground pieces of broken earthen wared and thus it appeared that the bag was full of coins. They straightway headed for Harmandir Sahib. On arriving there, they told the guards who checked their entry into the premises that they were village heads and had come to deposit land revenue with Massa Ranghar. Thus they managed to befool the guards and gained entry to Harimandir Sahib. They tied their horses with a tree near the entrance of the Harimandir Sahib now reveredly known as Lachi Ber and proceeded further. They found Massa Ranghar sitting on his cot fully intoxicated, smoking Hukka and watching dancing prostitutes. The scene enraged them. Bhai Sukha Singh remained near the door of main hall while Bhai Mahtab Singh went inside. He threw the bag under Massa’s cot and said, “ Here is land revenue.” Massa Rangar happily bent down to pick up the bag supposed to be full of coins. Bhai Mehtab Singh drew out his sword swiftly and with its single blow, cut off the head of Massa Rangar. Those present inside were stunned by the dudden development and ran helter shelter. In the meantime the two brave Sikhs took away the severed head of Massa Rangar, rode their horses and vanished from the scene before the guards could recover and realise what had happened inside Harimandir Sahib. They went straight to Jaipur showed Massa’s severed head to their Jathedar and othe colleagues there by redeeming their pledge. When Zakaria Khan, the Governor of Lahore, came to know of murder of Mass Rangar his anger knew no bounds. He immediately summoned village heads of all villages around Amritsar and ordered them to find out and arrest the culprits forthwith. Harbhagat Niranjania suspected it to be the handi-work of Bhai Mehtab Singh of Minarkot village. He told Zakaria Khan about his suspicion. Noorudin Faujdar, proceeded to Mirankot village accompanied by a band of soldiers with orders to arrest Bhai Mehtab Singh. Bhai Mehtab Singh was not present at his home but his infant son, Rai Singh was there. While leaving the village, Bhai Mehtab Singh had left his son in the safe custody of a noble person and his friend Natha Khaira. When Natha Khaira came to know of arrival of Govt. soldiers for arresting Bhai Mehtab Singh, he escaped from the village accompanied by Mehtab Singh’s son Rai Singh with the help of his friends. Nooruddin Faujdar come to know of the escape of the child Rai Singh and hotly pursued Natha’s party and caught up with the escapes. Natha and his trusted friends put up a brave fight and died fighting. The child Rai Singh was also gravely injured. Taking the child as dead, the Govt. soldiers went away. A kind woman passing that way happened to notice the child who was still alive. She took the child home and with her care and proper treatment the child recovered from the injuries fully. Five years later, in 1745 A.D., Bhai Mehtab Singh visited his village home to see his son. He was arrested with the help of some informer. He was brought to Lahore. Zakaria Khan ordered his execution through a most dreadful method. 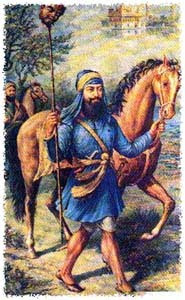 Bhai Mehtab Singh was put on the Charkhari (Consisting of two wheels fitted with sharp nails). The Charkhari (the two wheels) was rotated and the body of Bhai Mehtab Singh was cut by the iron nails fitted on the wheels, bit by bit. Thus Bhai Mehtab Singh was put to death in a brutal manner, but he was happy to lay down his life with the satisfaction that the desecration of the Sacred Harimandir Sahib had been avenged by him by the killing of Massa Ranghar. By his action, he proved that Sikhs do not tolerate desecration of their holy places and hold sancity of their holy places more dear than their lives.